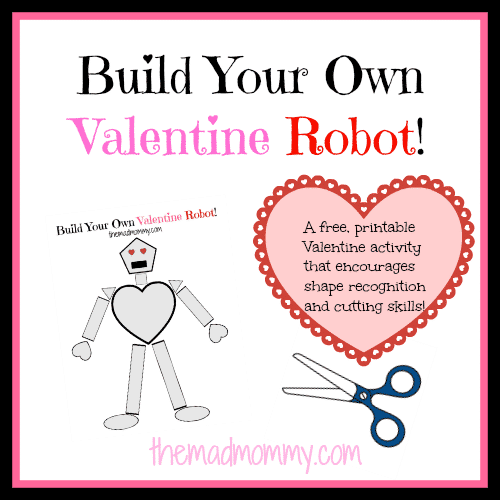 Build Your Own Valentine Robot! How about a Valentine Robot? 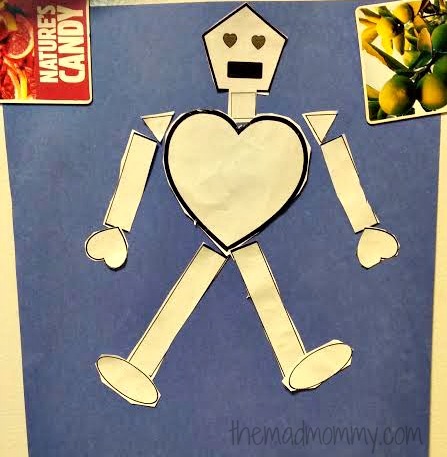 This cute Valentine printable allows your child to build their own Valentine Robot! This activity incorporates shape matching, scissor skills, fine motor skills, ability to follow instructions and quite a bit of fun too! There are easy to follow instructions, complete with adaptations for older children included in this free, downloadable Valentine printable. This is a great activity for all ages. Parents, you can cut out the shapes if your little one isn’t old enough for scissors and if your child is older, have them build the robot off of the template. The fun doesn’t have to stop after you build the robot! Have your kids name their robot, add background images, more hearts and whatever else their imagination desires! “Do you want to build a robot?” You can w/ this #Valentine activity for #kids! Here is an example of the older kid instructions, courtesy of my boy! So, do you want to build a robot? This is a very cute printable. It would be something that I could see a lot of children enjoying. It’s a great home activity. Thanks for sharing! Both of my kids really enjoyed it! It is a lot of fun, isn’t it? I was singing the same song in my head!lol!! I love that! My boys are both so into robots right now, so I have to print a couple of these out for them. They will have a blast. My boy loved it. Haha! Thank you for sharing us this printable – it is so adorable. It even caught me off guard – robots for Valentines, haha! So cute! I think they make super cute Valentines! That is really neat. I never thought that robots would make a good valentine until now! haha. Aww how cute is that print out. Perfect to do on a cold day and more personal since they are home made. It’s a fun, rainy day activity! My son is so into robots and cut outs, he would love this! This is so perfect then! Aww, I’m glad you like! I hope your little one enjoys it! I love this and have already printed it out for the little one to do during the witching hour today. Thanks so much. Pinned to my Valentine’s Day printable board. YAY! I hope you guys have fun with it, Sarah! AWW now that is super cute! 🙂 I love the idea. Great cutting practice too! The boy loves robots and will enjoy this! I liked that it incorporated a lot of skills in one fun activity. So cute! My daughter loves robots. Thanks for the printable! Thank you so much for coming by and seeing it! It was so much fun to do with the kids! Awesome! My 3 year old loves matching the shapes! What an adorable little robot! I am always on the lookout for cute printables for craft time during our home-school day! Thank you for sharing this one! No problem! We are always trying to change things up in our homeschool activities too! I totally sang the song. It’s ok.
Pinning this to my Deliberate VALENTINE’S Board! My kids love robots too! Ok, so my 10 year old son now thinks you are the coolest Mom ever 🙂 Thanks for sharing Echo! Hahaha! Aww, you’ll be the coolest mom for printing it out! Thank you! I hope they love it like my kids did! My son has been mastering his fine motor skills lately…this would be a perfect activity for him to do for Valentine’s Day! Awesome! I am so glad you found it! Robot looks so cute! Perfect for hands on activities for children..
It’s a great hands on activity and fun too! This is such a cute printable! I’m sure a bunch of kids that I know would love this! Love it! It’s super creative! Thank you so much, Olivia! I just wanted to make it fun! My little guy can’t do this alone. I’ll do it with him and hell love playing with the robot. My daughter can’t really cut well yet either, so I helped her along! The kids can use their imaginations with it as well! That is one of the best parts! I hope you do it and enjoy it! I loved making it and doing it with my kids! Awe…I love the design of your Valentine’s Day Robot – he’s so cute. You can also make a ‘lady’ one with a bow on the top of her head. Very cute tutorial for kids for the romantic holiday. That is so very, very true! A girl robot would be adorable! Hahaha, but you give them some heart eyes and they are ready to smooch and love! Omg this is awesome!!! My daughter has been on a leapfrog kick lately & one episode has a robot…. Will have to print this out for her!! My kids love Leap Frog too and robots! Echo this is so cute!!! Little Mo loves cutting and gluing stuff so I may have to download this for a cute weekend activity. Aww, Thanks Alisha! She will love this! This looks like a great activity to do with kids! My kids are too old now but I love that it works on fine motor skills disguised as fun. That is so cute, LOL! I can just picture it! I hope she enjoys this! this would be perfect for a school V-Day party! Super cute! Thanks for post Thanks for linking up at the Momma Told Me Link Party! This would be a great group activity! Thanks for coming to check it out! Thank you, Jill! I hope you guys enjoy it! What a cute tutorial you have share on Friday Features this week, thank you for stopping by!! This is a really cute Valentine’s activity for kids! Thanks for sharing it with us at the #HomeMattersParty this week. We hope you will link up again next Friday. So adorable and fun! What a great printable craft Echo! Do you want to build a …. (robot)….oh yes…robot!!!! Way better than a snowman…lol. He seriously has to make the cutest Valentines card. Too cute. Pinned it to my Valentine board. So glad you shared with us at Merry Monday. Please be sure to come back Monday for the new party! What a cool idea! Something the boys would like better than red and pink hearts every year. Thanks for sharing on the Love the Learn hop! How cute – I love how it’s so different from what you usually see for Valentine’s Day! There is love in his eyes 🙂 Adorable! thanks for sharing the craft.. stopping by from Sandy Creations hop. This is super adorable. It’s like the tin man is all heart now.